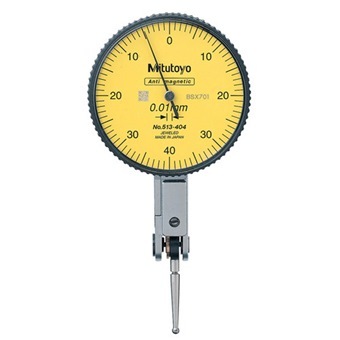 MITUTOYO SERIES 513 DIAL TEST INDICATOR is rated 5.0 out of 5 by 1. Performs easy and accurate measurement of narrow or recessed areas, plus inside and outside diameters that dial indicators cannot access. No clutch structure for automatic reversal of measuring direction. Resistant to water and dust thanks to the one-piece bezel and crystal design with O-ring. High-sensitivity and quick-response because of jeweled bearings. A carbide contact point is provided as standard. 513-409 0.2mm / 0.0075" Resolution 0.002mm / 0.0001"